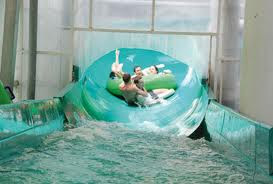 We need a new, indoor activity for the family, so we head out to Aquaboulevard. 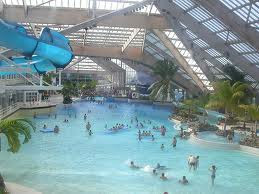 It's a huge indoor-outdoor waterpark for ages three and up just at the edge of Paris, and it costs a small fortune (naturally), but it really is something to see. Speedo style and shorts so small I have taken to calling them teeny-weeny manokinis. He looks at me and says, pointedly and very sincerely, "You will NEVER see me in one of those." 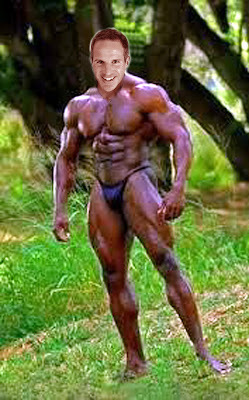 Flash-forward about five minutes, and I look up to see him walking toward me in his new Euro-metrosexual bathing suit. There are numerous signs that long shorts are not allowed, and that everybody must be in a bathing suit, but the girl at the desk had told us she thought Anthony's American-style suit would be acceptable. The lifeguards and staff in charge of the pool itself disagree, however, and they bust him within minutes. So, he leaves us in the pool area and heads over to the vending machines, where he agonizes for a few moments deciding between sizes and coming back with something that leaves little to the imagination. We are all curious why the insistence on tight suits for men (and not just here, but at all public pools in France); they claim it's for hygienic purposes, but that doesn't explain it adequately, as we can't figure out why board shorts would be unhygienic. Perhaps it's just a fashion aversion to bagginess? Macho exhibitionist desires? Aquaboulevard has a rope swing, seven big water slides that are currently open (with four more closed along with the outdoor portion of the park for winter). For one of our favorite slides, we crowd into a huge green raft which takes us through a mighty chilly outdoor portion before depositing us back indoors. It is not just fast for the kids; even Anthony and I are whooping it up. All of this aquatic fun can be had for 28€ per adult and 15€ per child (and a few more euro for the teeny-weeny manokini) at the front desk. It appears after-the-fact that there may be a family pass (2 adults and 2 kids) for just 52€, but it's not offered to us and is unclear whether this needs to be bought online in advance or, the next time, we need to know enough to ask for it explicitly. Needless to say, this time we do not know, and they charge us 86€ ($113) for the family of four. We are there for about two-three hours before we are purple-lipped and starving. The day gets a huge thumbs up from all involved, and Anthony comes home with a uniquely French souvenir that will come in handy at our next public pool. In France. This is yet another cheese that does not appear in my encyclopedia, or in any online cheese sources. I swear I'm not trying to buy unusual cheeses; I just keep getting attracted to them. And who wouldn't be attracted to this beautiful cheese? The distinctive shape, the soft green-gray mold on the wrinkled crust. You just know that after a while warming up in the sun, you're going to cut into it (impossibly -- how to begin?) and then it's immediately going to ooze all over the plate. And yes, yes it does ooze. 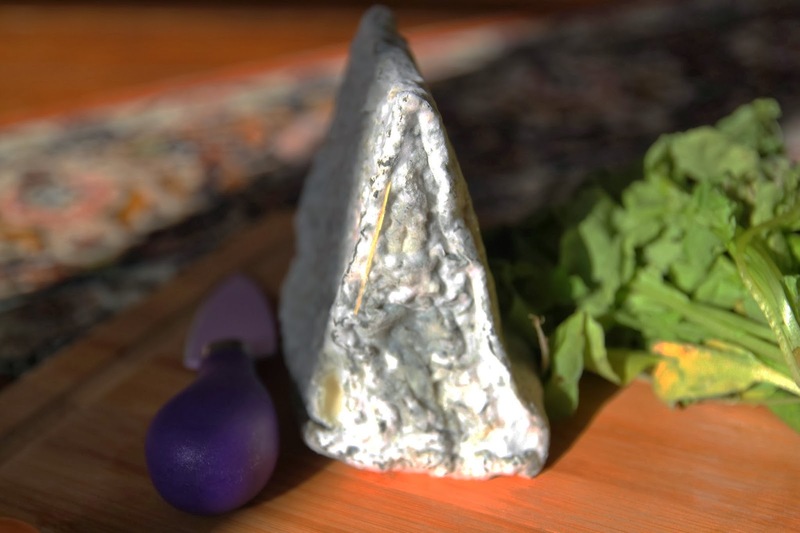 Pentu de l'Etang is a goat cheese from the Indre valley in Loire castle country that is aged two months, which is a long time for a goat cheese. That gives the moldy crust time to develop, and also makes for fuller flavors. It's strong, earthy, and with a strong acid finish. And texture: A French journalist described it as a "crème gaillarde", which means the cream is sprightly. What, you ask, is sprightly cream? When it comes to Pentu de l'Etang, it means it's wet and oozy just under the crust, with a slightly firmer heart. Pentu de l'Etang literally means "Steep of the Pond." That, along with the look of the cheese, cries out to me "Water Slide!"